The Pesticide Action Week, an international event in its 13th edition, was held from March 20 to 30, with the aim to promote sustainable alternatives to pesticides. Dozens of events, conferences, workshops, guided tours have united Europe in the name of a more sustainable future, in order to inform people about the damage caused to health and the environment by the use of synthetic pesticides. Also PAN Europe has made its voice heard, choosing this year Italy to focus on. Across a red thread that has united the Bel Paese from North to South, PAN Europe celebrated the Week with very interesting events, as defined below. In Bolzano an important meeting took place between the representatives of PAN Italy and the Municipality of the town, which recently joined the Pesticide Free Towns Network. The overall aim of the Network is to bring together a critical mass of towns committed to phasing out pesticide use and provide a European platform of mutual support and experience, practice and knowledge sharing. The Mayor of Bolzano, Renzo Caramaschi, together with the Assessor for the Environment, Maria Laura Lorenzini, has strongly supported this adhesion as a natural continuation of their successful environmental policy: "We have joined the Pesticide Free Towns Network because we believe that it’s necessary to take any action in order to protect citizens’s health. For this reason since 2016 the Municipality of Bolzano has banned the use of glyphosate ", said Lorenzini to Koen Hertoge of PAN Italy, promoter of the meeting. The meeting aimed to attract interest from the neighboring Municipalities, hoping that they will decide to follow this good example by banning the use of chemical pesticides in their green areas. Koen Hertoge's (PAN Europe Board member and local activist) reaction is enthusiastic: “We welcome this important step to stop using chemical pesticides on public places, in order to also protect the health of the citizens. It shows that there are sustainable alternatives, and that it is feasable to choose for a healthier future. We hope that other towns like Merano and Bressanone will follow this example”. Moving from the North to the Center of Italy, PAN Europe arrived to the Botanical Garden in Selva di Gallignano in the province of Ancona, where an interesting guided tour on aromatic herbs, medicinal plants and forest ferns took place on March 25th. After the walk we had the opportunity to taste delicious dishes cookied by using spontaneous herbs and to interview Fabio Taffetani (watch the video here>>), the President of PAN Italy, Professor of Botany at the Polytechnic University of Marche and coordinator of the Botanical Garden. The result was a compelling confrontation on how to allocate green areas to the growth of edible wild plants and on the actions to be undertaken to make the beauty and the utility of spontaneous plants in urban areas appreciated. In this symbolic journey along Italy we reach the South, where PAN Europe had a meeting with the Mayor of Casalduni (Benevento), Pasquale Iacovella, who told us how, by banning the use of chemical pesticides in all the green areas of his town, he solved the problem of groundwater pollution, protecting, at the same time, the health of citizens and the biodiversity of the territory. 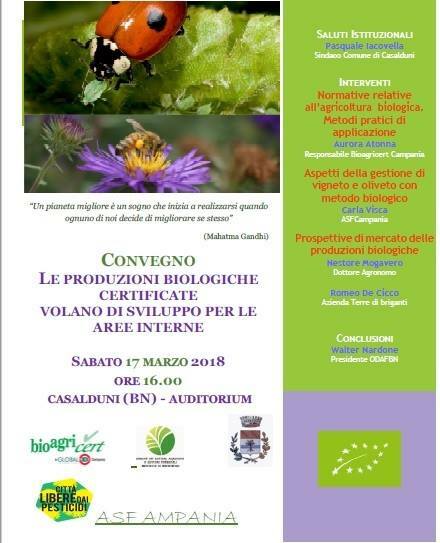 Casalduni policy is particularly attentive to environmental sustainability and, according with the main topic of this Pesticide Action Week edition, that is organic food, has recently hosted an interesting conference on organic food as a key for the development of internal areas. Because the town of Casalduni has joined the Pesticides Free Towns Network, in his interview Iacovella took the opportunity to invite other Mayors to do the same. Meetings, interviews, guided tours, conferences: an interweaving of activities unfolding through different narrative voices, but the common goal of informing and involving citizens in a more sustainable, healthier and just Europe. Why are our EU regulators so reluctant to protect us from hormone disruptors?